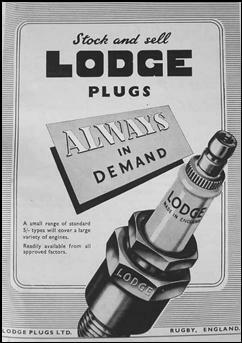 Firstly I will not profess to be an expert on this subject but that it enlightens the reader into the dark side of the workings of the spark plug in our Austin Seven engine. 1. 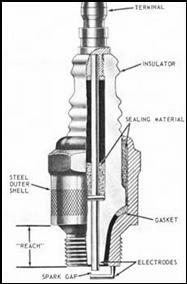 To remove the plug from the engine, one must first disconnect the insulated lead called the ‘HT lead’ [HT = high tension] from the plug, this is by either a simple pull off cap, or there is a small brass nut which screws onto the top thread of the plug and the HT lead is held on by a brass terminal. 2. The plug now can be removed from the cylinder head with the aid of a suitable spanner. This spanner not only must be a proper fit on the hexagon part of the plug but ideally it should be a box or socket type which bears on all six sides of the plug. The ordinary open ended spanners, particularly adjustable variety, should not be used, because the body of the plug is comparatively thin and is liable to be distorted. 3. Even when using the correct box or socket one must be very careful not to tilt the socket over to one side. Damage to the insulator can easily happen if care is not taken. Also watch out for your hands and knuckles as the seven engine bay is not that large! 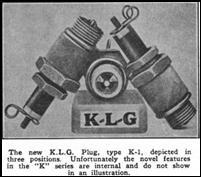 Plugs with detachable centre electrodes, made up of several components were widely used before the war. The cleaning of these plugs is a lot easer as all the parts can be dismantled. The majority of new replacement plugs are not detachable and the cleaning of these is more difficult, This is best done with a scribe or small ‘brass’ wire brush and some paraffin to remove the oil/carbon deposits. Another important point about a plug is its ‘reach’ i.e. the length of the part which goes into the engine. On the right is a plug with too much reach; the earth and central electrode are exposed to the combustion gases: pre-ignition is a likely result. The threads are exposed and may cause damage to the cylinder head thread when the plug is removed due to heat damage or carbon build up. Also, the plug may touch on to the top of the valve and the consequences of this just do not bear thinking about [so not a good idea to have them too long!]. On the left there is too little reach: this may make starting difficult and slow running / tick-over erratic. The correct reach is shown in the middle. With our ignition system it is best to ensure that the coil is wired up correctly. 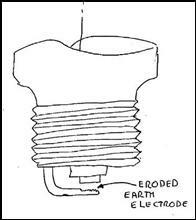 The correct polarity is critical for the best performance from the spark plug. 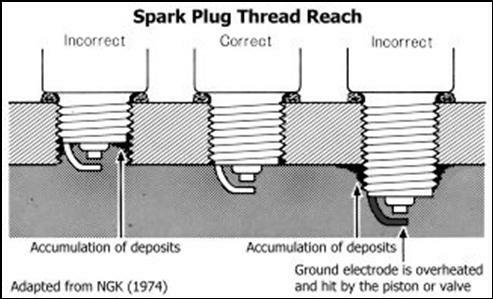 If the coil has been incorrectly set up with the SW [ignition SWitch side] wire and the CB wire [Contact Breaker /or points] crossed over, then you could lose anything up to 40% of the spark performance as the spark has now to jump from what would normally be the earth electrode to the central electrode. So cold engines may be more difficult to start in the mornings, perhaps this is worth a check? The sketch shows the erosion effect of a reversed polarity on a sparking plug. It is a good idea to mark the wires on the coil so that it is difficult for these to be crossed. There are ‘hot’ or ‘cold’ plugs. A 'hot' plug transfers combustion heat slowly and is used to avoid fouling in engines with relatively low combustion chamber temperatures. A ‘cold’ plug on the other hand, transfers heat rapidly from the firing end and is used to avoid overheating, where the temperatures are high in, say, a high compression ‘race’ engines. Normal - Correct plug Insulator is white or very light tan to rust brown. Too cold [use hotter plug] Insulator is a dark grey or black sooty deposits. Too hot [use colder plug] Insulator very white. As you can see from this cross section, that big heavy looking hexagon on top of your cylinder head is actually pretty thin and delicate - hence the need to use a proper spanner. The detachable type, shown in the advert, had a second internal thread that allowed the whole ceramic portion to be removed for cleaning. Variants with multiple electrodes also appeared in the thirties. Correct type for Austin Seven as recommended by Austin Motor Co. which I believe was correct around 1939. This article, written by Mike Davies, originally appeared in CA7C Seven Focus in Dec 2008 pp22-25. 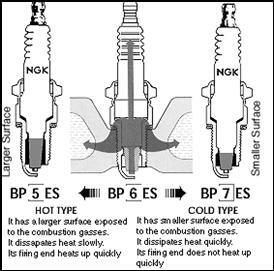 Website: http://gsparkplug.com/technical-information has excellent information on: How Spark Plug Works; Spark Plug Construction; Spark Plug Fault Diagnosis; Spark Plug Gap Settings; Heat Range.